Beginning October 2, State Library Services is offering free, online, research-based training for anyone who provides storytime in a library. All experience levels are welcome! Whether new to storytimes or seasoned providers, Supercharged Storytimes for All, a six-week online course, offers knowledge to deepen and enhance anyone’s storytime practice. OCLC put together an eight-minute video that provides an overview of the research behind Supercharged Storytimes and the four key elements: interactivity, intentionality, assessment and community of practice. Because OCLC has recently expanded the content, with input from early literacy expert Saroj Ghoting (among others), even those who participated in Supercharged Storytimes in 2015 will gain knowledge from this iteration. Growing intentionality and building peer community. Course participants will acquire knowledge and skills through live webinars presented by trainers from across the state. In between live sessions, they’ll have time to put their learning into practice by using tools and resources introduced in each session, to plan their storytimes, deliver the storytime with intentionality, and then reflect with each other through peer discussion forums. While it is best to attend the webinars live, they will be recorded and can be accessed at a later date/time. We estimate that coursework will be an average of three hours/week to attend live sessions and apply the learning in between. We encourage all participants to gain supervisor support to assure sufficient time to devote to this course. The outcome of a more impactful library storytime is an asset to the whole library/library system in advocating for the value of libraries in early childhood development. 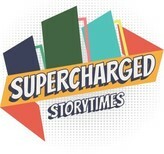 Register today for Supercharged Storytimes for All. Contact Jen Verbrugge (651-582-8356) if you have any questions or for more information. State Library Services is partnering with Girls Who Code to bring free computer science opportunities to elementary, middle, and high school girls (and boys) across Minnesota. We would love for your school or library to host a club! Girls Who Code Clubs are no-cost afterschool programs for girls in grades 3-5 or grades 6-12 to join a fellowship of supportive peers and use computer science to change the world. The program targets girls, but no one is excluded from participating, so boys are welcome too. Clubs are led by facilitators who can be teachers, librarians, parents, or volunteers from any background or field. No prior knowledge is required; many facilitators have no technical experience and learn to code alongside their club members. Read through an overview of the curriculum for both age groups, and then attend a Girls Who Code webinar to help you learn more. You can also contact Leah Larson (651-582-8604) if you have questions about how to get started. *Important Note: To receive partnership benefits when you register your club, it is important that you indicate that State Library Services is your partner. Please list “Minnesota State Library Services” as your partner affiliation on the application’s page titled “About Your Club” for the following question: Is your Club affiliated with a Girls Who Code Community Partner (school districts, library systems, nonprofit organization, afterschool networks, etc.)? The 2018 Minnesota Legislature allocated a total of $1,000,000 to the program. In addition, approximately $400,000 of the allocation from the 2017 bonding bill is available to award as grants, for a total of $1,400,000. If more funds become available, we will update the amount. Application forms and instructions are available on the Minnesota Department of Education’s Grants Management site. Scroll to Library Construction Grant opportunity. Completed applications are due via email by Friday, October 26, 2018, at 3:30 p.m. For more information, please contact Emily Kissane (651-582-8508). On Saturday, October 6, 8-11 a.m., join other library staff working with kids at this unique professional development meet-up. Get together with area colleagues to share experiences and ideas. Potential topics include using Ebooks Minnesota, successful school and public library collaborations, and building your local networks. The agenda will be refined by the registered participants. Library staff working with youth from all kinds of libraries are welcome to participate in this no-cost event. After the meet-up, plan to go out for an optional lunch and tourism in beautiful New Ulm. The event is sponsored by Traverse des Sioux Library Cooperative in partnership with State Library Services. Up to three continuing education contact hours are available. Contact Ann Hokanson (507-625-6169) for more information. Lights On Afterschool (LOA) is the only nationwide event celebrating afterschool programs and their important role in the lives of children, families, and communities. This year, afterschool-library partnerships are celebrated as an official theme for LOA 2018, which takes place on October 25. This is a great opportunity to showcase an afterschool or summer program that you run out of your library, highlight a partnership you already have, or embark on a new partnership with an afterschool program in your community. The Space Science Institute’s National Center for Interactive Learning (NCIL) provides interactive STEM exhibits, programming, and training to public libraries nationwide through its Science‐Technology Activities and Resources Library Network (STAR Net), and is a sponsor of LOA this year. You can watch their recorded webinar to learn more about LOA, and how your library can participate. Register your LOA event today to begin receiving emails full of expert advice, free resources, and the chance to win giveaway prizes. The 2018 Library Journal architectural feature will be published in the November 15, 2018, issue. It will collect data for finished public and academic library projects—new builds and renovations/additions—completed between July 1, 2017, and June 30, 2018, only. If you have not submitted your library’s construction projects yet, please complete the architectural questionnaire for Public Libraries or Academic Libraries by Wednesday, September 12. Public libraries are places and spaces where people can relax, work, meet, learn, connect, and create. Total Minnesota public library square footage in 2017 was 8,559,412, bigger than the Mall of America (7,900,000 square feet). Minnesota’s public libraries come in all sizes. Hanksa Public Library, built in 1915, is Minnesota’s smallest library (403 square feet). Hennepin County Library’s Minneapolis Central Library, built in 2006, is Minnesota’s largest library (406,354 square feet). The average public library size is 16,493 square feet and the median size is 5,625 square feet. Minnesota had four newly built libraries in the late 19th century. Taylors Falls Public Library, Minnesota’s oldest library building, was built in 1857. Few libraries were built during the Depression and WWII. There was a library building boom during the 1990s and 2000s. Libraries did not report remodeling projects until the 1970s. 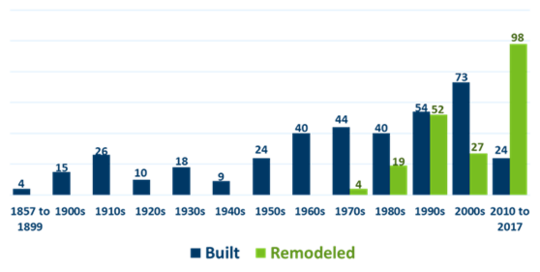 There has been a remodeling boom since 2010—especially to incorporate new technology. Eighteen percent of Minnesota’s public library buildings were renovated in the past five years compared with a national average of 21 percent. Minnesota had 66 Carnegie libraries. 48 are still standing and 25 of those continue to house public libraries. Of the 18 lost libraries, one burned down and the rest were demolished.